What Is a Student Mock Election Map? Do you vote by party loyalty or by the issues? Should the President and Congress be from the same party? Would the nation benefit from the rise of a strong third party? Beginning in 2018, New Jersey educators can now submit student votes online using Mapline’s redesigned, digital platform. To sign up, teachers simply register their school with a name and email address. Then, Mapline generates unique codes for each student to use when they cast their ballot. Codes signify a student’s grade and school, but do not collect personally identifying information. This new method is streamlined, and it gives teachers and students the ability to submit votes right from the classroom, instead of handing ballots off to a district supervisor for bulk submission. Alternately, printable ballots are available for schools that don’t use Chromebooks or wish to tally paper ballot totals and submit the totals online. Once all votes have been cast, Mapline generates maps showing which candidate or issue received the most votes. Mapline tallies results by congressional district and by grade. 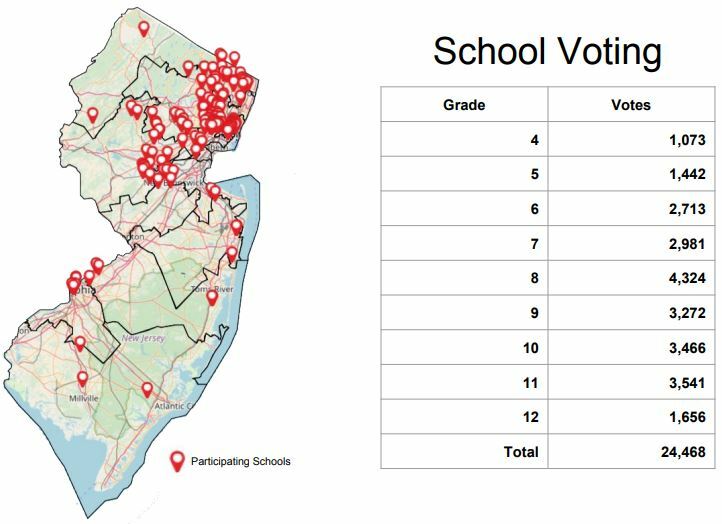 Students from all 12 New Jersey congressional districts voted with 24,468 students casting votes. Approximately 12,533 students were from grades 4–8 while 11,935 students participated from grades 9–12. A total of 63 maps are available as PDF downloads showing the results from the 2018 New Jersey mock election, including raw numbers and easy-to-read percentages. Mapline’s territory heat map overlays provide color-coded maps by candidate, issue, grade level, and location that give educators and students the opportunity to analyze and discuss voting patterns in their home state. Critical thinking questions and lesson plan activities are available online for educators to pair with election results. Mapline stands out from other mock election platforms for its granularity and realistic, inclusive experience. With this year’s revamped platform, Mapline has the power and scale to engage thousands of students in New Jersey elections and help educators promote the importance of civic duty. To learn more about mock elections, check out the official New Jersey mock election website. Explore how you can use mapping software to make a difference in academia from mock elections to higher education.